Just a simple squeeze and release is all it takes to keep your work held securely in place. 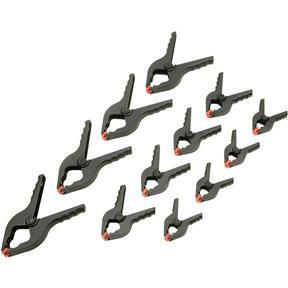 These spring clamps are unbeatable for securing glue joints, clamping jigs, holding down tarps, or hundreds of other shop chores that require an "extra hand". Handles are contoured for comfort and control. 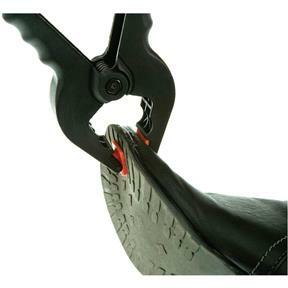 Non-marring jaws pivot to increase their grip on uneven surfaces. Tough polymer construction. 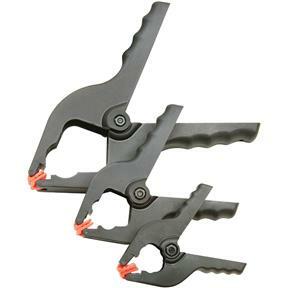 Includes four each of 1", 2" and 3" spring clamps. They're just plain handy in a variety of situations. Can't have too many.